Croatia is a beautiful country with some incredible places to visit, which makes deciding which spots to add to your itinerary tough! The country is home to the stunning Krka National Park and Plitvice Lakes National Park, as well as a number of wonderful historic cities, including Dubrovnik, Split, Sibenik and more! Your Croatia itinerary can easily go from 5 days to 7 days to 14 days as you try and fit in everything there is to see. 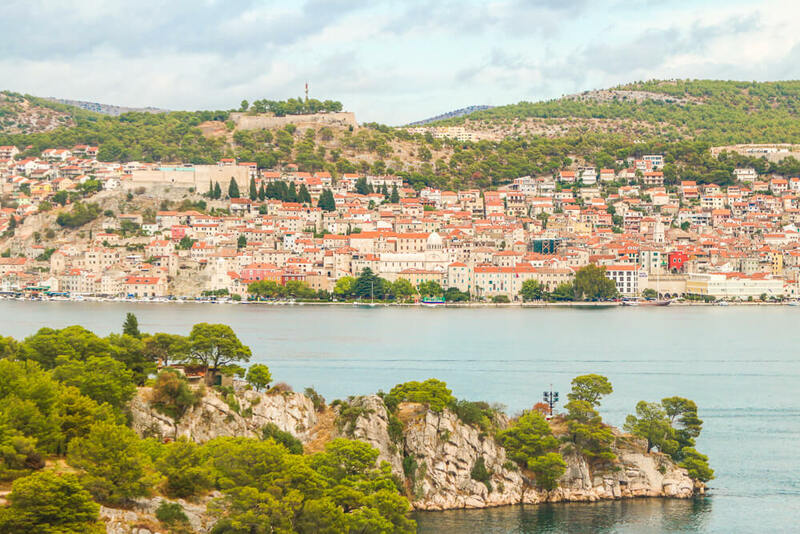 To save you the hassle, we’ve come up with an itinerary for Croatia that takes you from Split to Sibenik to Dubrovnik in just 10 days, covering day trips to amazing national parks, numerous Old Towns and several Game of Thrones locations. 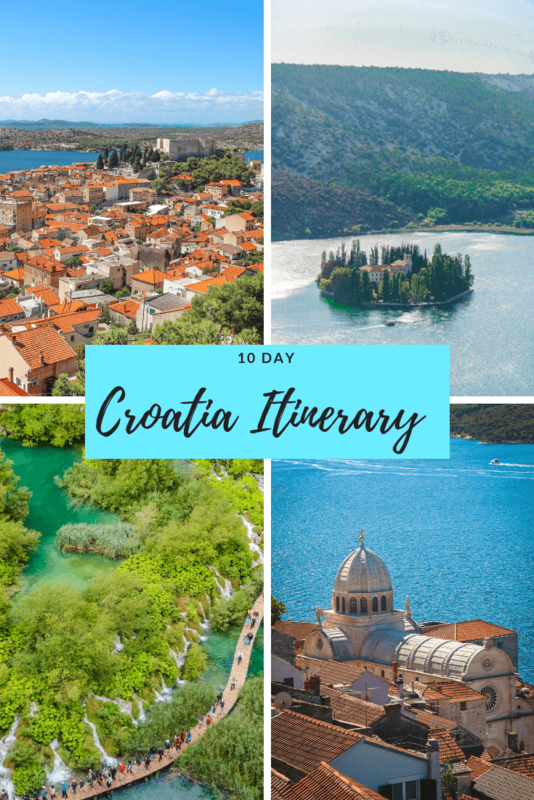 Follow the travel itinerary below to see the best of Croatia in just 10 days! The first step of your trip is getting to Croatia. As your first destination is Split, book a flight into Split Resnik Airport. 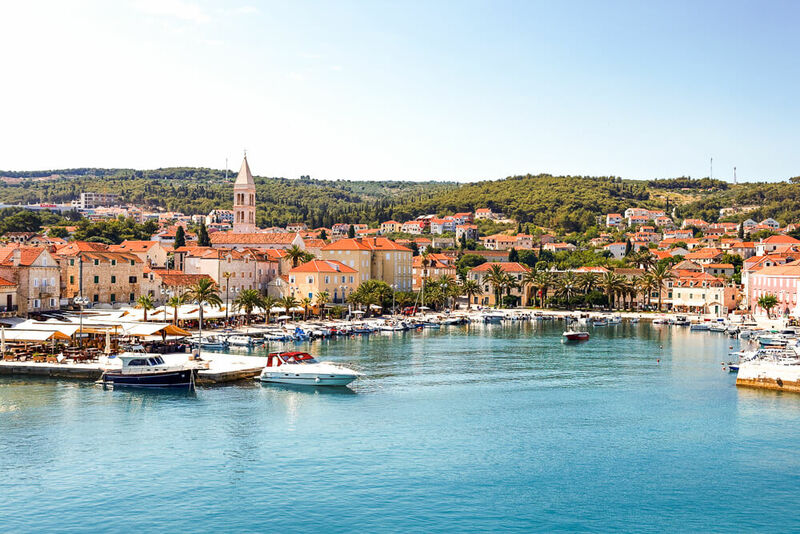 You may need to catch a connecting flight, as direct flights to Split are only available from certain European destinations. As Split airport is about 20 kilometres from the city, you’ll need to catch a bus, take a taxi or rent a car to get there. We strongly recommend renting a car for travelling around Croatia as it makes visiting the incredible sights and national parks much easier. Car rental prices in Croatia are extremely reasonable and in some cases rates start at less than $25 USD per day, even when you return the car in a different city! Book in advance for the best prices and that way you can pick up your car much quicker on arrival. Click here to find great car rental deals for your trip! After picking up your rental car, drive to your accommodation in Split to drop off your things and settle in. When you’re ready, have a wander along the Riva promenade – a pleasant area on the waterfront. Make sure to take it easy and enjoy a nice meal and some drinks in the evening before calling it a night. Day 2 of your trip is your chance to explore the Old Town of Split and Diocletian’s Palace. First stop should be the Gregory of Nin/Grgur Ninski statue, located just outside the city walls by the golden gate. Rubbing the big toe of the statue is said to give you luck, so it’s worth a quick rub before heading through the gate into the Old Town. Spend the day discovering the different streets and architecture found within the city walls. 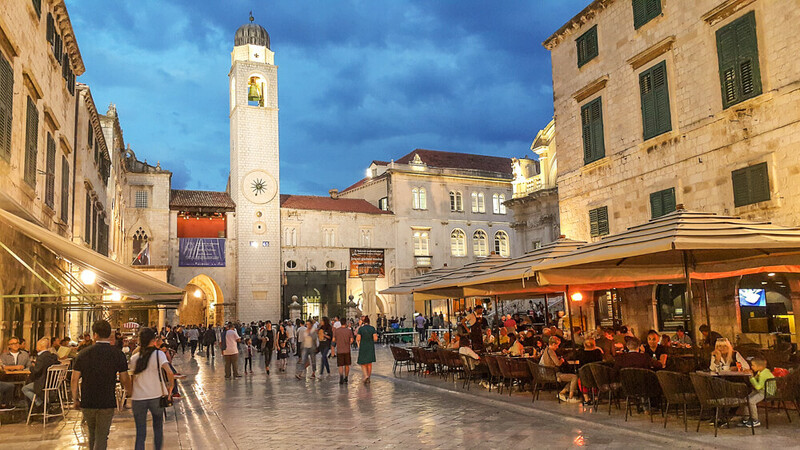 Make your way to the bustling Peristil Square, the former entrance to Diocletian’s Palace at the heart of Split’s Old Town. There’s plenty to see and do whichever way you turn, but while you’re here don’t miss the chance to go up the bell tower of the Cathedral of Saint Domnius. The tower offers brilliant views across orange rooftops and the Old Town. Entrance to the bell tower costs just 20 Kuna. Alternatively, you can buy a ticket for 45 Kuna, which allows entrance to the bell tower, crypt and treasury. Whatever you do though, don’t miss out a trip up the tower! Take the day at a leisurely pace, there’s plenty to see but enough time to take it all in and appreciate it. There are a number of restaurants in the Old Town, so stop for a drink or bite to eat if your feet need a rest. Once you’ve finished exploring for the day treat yourself to a good meal and a few drinks before calling it a night! The third day of your Croatia itinerary takes you to the island of Hvar. 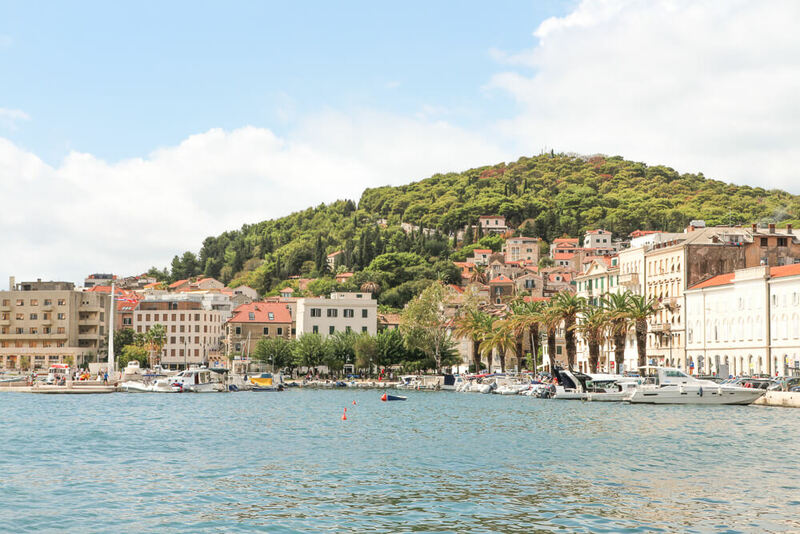 You can either take a catamaran or ferry from Split to Hvar town, which costs 55 Kuna each way during the summer months, and slightly less during the rest of the year. It takes between 1 and 2 hours to reach Hvar from Split, depending on the boat you take. We recommend visiting Hvar town, but it’s also possible to catch a ride to Jelsa and Stari Grad if you’d prefer. Boat times vary depending on the time of year, but try to catch the first boat leaving in the morning and the final boat departing from Hvar to Split in the afternoon/evening. Click here to search for an up to date boat schedule. Once you’ve arrived at Hvar Town, climb up to Spanjola fortress for views of the Pakleni Islands and the town’s picturesque orange rooftops. This wonderful view is well worth the walk up! Enjoy lunch in Hvar town before making your way to one of the beaches. We recommend Sirena beach, which you can walk to from the town in around 30 minutes, or take a taxi if you prefer. It’s a pebble beach and is found in a small cove in front of hotel Sirena. Spend the afternoon relaxing on the beach before catching one of the last boats back to Split. If you’re able to add a few days to your Croatia itinerary then it’s possible to stay in Hvar and explore more of the beautiful surroundings. In particular, you may want to consider a trip to the glorious beaches of the Pakleni islands and the impressive blue cave. Don’t worry if you don’t have more time though, as the rest of the trip will take you to some of the most beautiful places in Croatia! If you’re looking for accommodation near the Old Town on a budget then check out the Split Inn Apartments. The location is hard to beat and the apartments are fitted with air con to keep you cool on those hot summer days. You won’t find much better than this if you’re trying to keep costs down! Prices start at $50 USD (325 Kuna) per night. Click here to check out the great prices at the Split Inn Apartments on Agoda! Just a short walk from the golden gate entrance to Split Old Town, the Contarini Luxury Rooms are a great option if you have a bit more to spend. Rooms are spacious, comfortable and fitted with air con, and parking is also available for an extra cost. Rooms start at $140 USD (900 Kuna) per night. Click here to see the latest prices at the Contarini Luxury Rooms for your trip! The Dioklecijan Hotel & Residence boasts a rooftop swimming pool with brilliant views, making it perfect for a luxurious stay in Split. As the hotel is around a mile away from the Old Town, the rooftop views are particularly lovely at night. All rooms at the property are modern and air conditioned, with everything you need for a comfortable stay. Rooms start at $222 USD (1,430 Kuna) per night. Click here to book a luxurious stay at the Dioklecijan Hotel & Residence! After 3 days exploring Split and the surrounding areas, it’s time to move along the coast of Croatia to Sibenik. 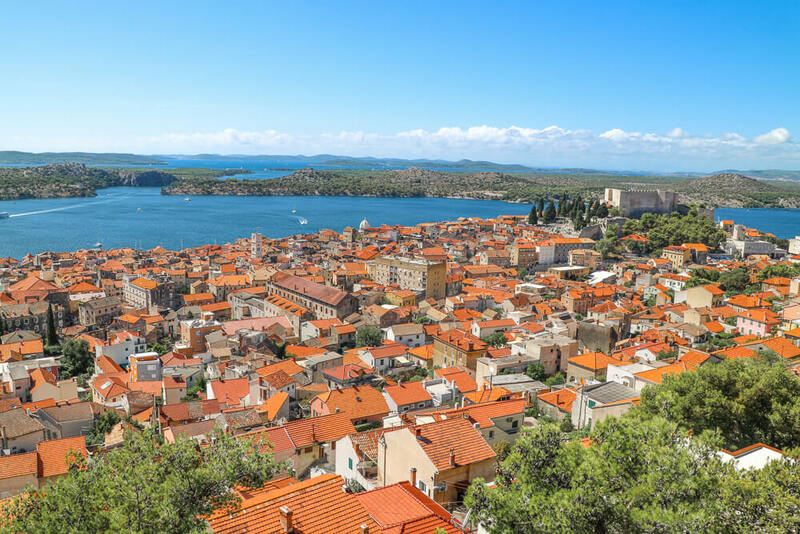 Depending on your preference you can drive directly to Sibenik, or take the longer route and visit Trogir – a pleasant Old Town not too far from Split. 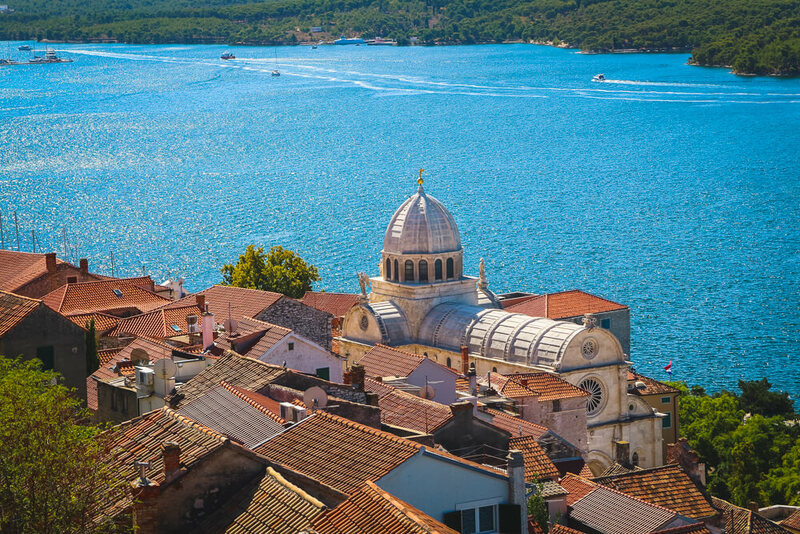 Trogir is a UNESCO World Heritage Site, and is a lovely spot to visit on your trip. If you decided against renting a car, we recommend travelling around Croatia by coach. Click here to book coaches between Split and Sibenik and many other spots in Croatia! There’s plenty to see once you arrive in Sibenik, so make sure not to arrive too late or you’ll have to miss some bits out! The city has a wonderful Old Town to explore, filled with cobblestone streets and brilliant architecture. Particularly impressive is St James’ Cathedral, and its dome can be seen towering above surrounding buildings from viewpoints across the city. The Sibenik Cathedral is considered the architectural masterpiece of the Dalmatian coast, and as such is a UNESCO World Heritage site. If you wish to go inside the Cathedral of Saint James then there is a 25 Kuna entrance fee. If you still have time to spare, then you can visit any of the 4 fortresses of Sibenik. You can buy a combined ticket to visit Barone fortress and St. Michael’s fortress for 50 Kuna. Both offer brilliant views of Sibenik, although we preferred the view from Barone fortress, as it’s 80 metres above the city. St. Nicholas’ fortress is probably the most impressive of the 4 found in the city, as it was built at sea and is only connected to the mainland by a narrow path. St John’s fortress is located 115 metres above the city and has been used as a filming location in the popular TV series Game of Thrones. There is currently no entrance fee at either St. Nicholas’ fortress or St. John’s fortress. Click here to find out more about the fortresses and the whole city in our Sibenik guide! Once you’ve finished exploring Sibenik, enjoy a nice dinner before heading back to your accommodation. The next day requires an early start so we recommend setting an early alarm and getting a good rest. 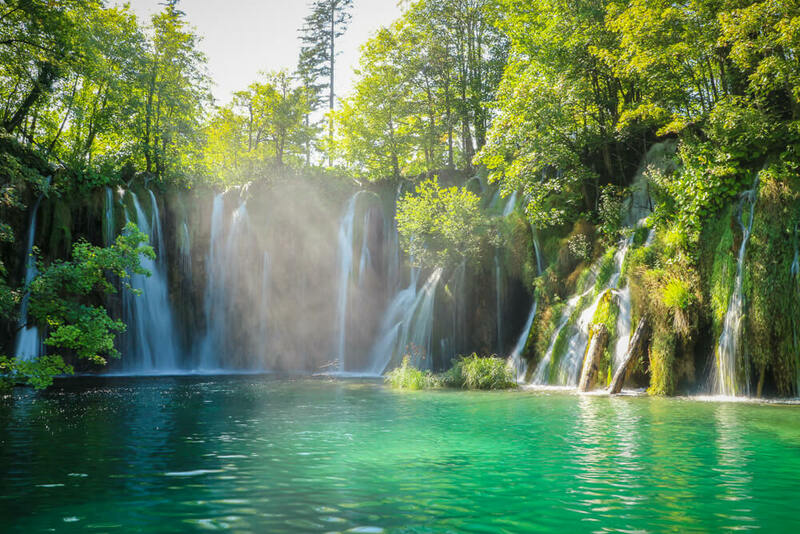 Wake up around 4.30am and prepare yourself for a day trip to one of the most beautiful places to see in Croatia – Plitvice Lakes National Park. Check the current opening times of the park before hand, and take into account it takes around 2 hours to drive from Sibenik to the Plitvice Lakes. To avoid the crowds you’ll want to arrive before opening time, particularly during the busier summer months. During summer the park normally opens at 7am, so unfortunately the very early start is necessary! Find out the most beautiful spots in the park and everything you need to know about visiting with our guide to visiting the Plitvice Lakes National Park. Plitvice Lakes National Park is a truly amazing place, home to a series of 16 interconnecting lakes and a number of spectacular waterfalls. The water of the lakes is unbelievably clear and an alluring turquoise colour, which adds to the charm of the park. Unfortunately though, swimming is forbidden within the park, but this helps to protect the nature. There are a number of walking trails throughout Plitvice, with more than enough wonderful nature to see to fill your entire day! The entrance fee to the Plitvice Lakes varies depending on the time of year, with tickets costing 250 Kuna per person during peak season. Click here to see pricing information for any time of year on the official Plitvice Lakes website. Once you make it back to Sibenik you’re bound to be tired from a day of exploring. Reward yourself with a nice meal and a drink or two before heading to bed as you have a relatively early start again the next day. Set an alarm for 7am, and get ready for a day of exploring Krka National Park. We recommend driving to the Losovac entrance at Krka, which takes about 20 minutes to get to from Sibenik. This entrance is closest to the famous Skradinski buk waterfall, where it’s possible to swim in the pool at the base of the falls between June and September. As Skradsinki buk is the most popular attraction in the park, you’ll want to arrive before opening time to avoid the crowds. Buy your ticket as soon as the ticket booth opens and walk down to the start of the trail rather than wait for the bus. The bus waits until full before leaving, so it’s quicker to walk down and get ahead of the crowds! Once you reach the start of the trail it’s around 15 minutes until you reach the falls. You should be one of the first there, meaning you can get some brilliant photos without other tourists in, as well as being one of the first to swim in the falls that day. Enjoying a swim in the cool waters is one of the best things to do in Croatia! Although most people only visit Skradinski buk in Krka National Park, there’s plenty more to see! The park is so big that you need to drive between different locations, but it’s well worth going to the viewpoint of Visovac island and Manojlovacki Slap – the tallest waterfall in the park. Click here to find to read our detailed guide on what to see in Krka National Park! 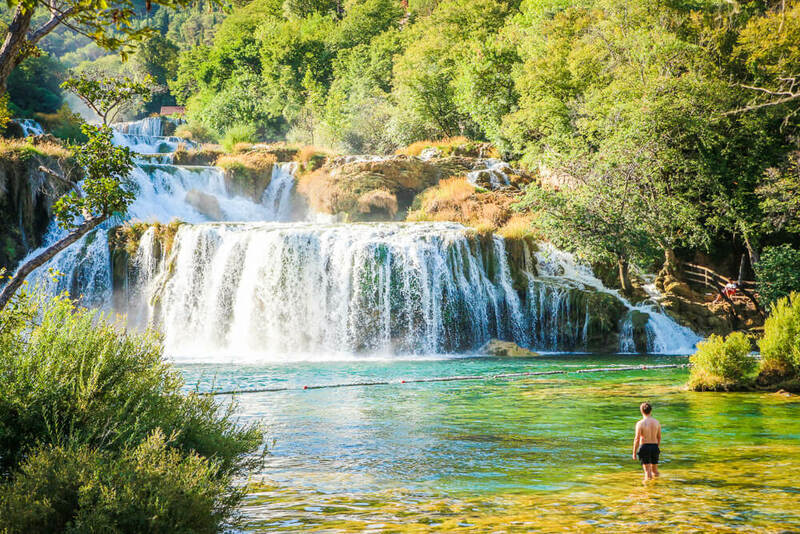 The cost of entry to Krka National Park varies depending on the time of year, with the most expensive price being 200 Kuna during the peak season of July and August. Click here to see up to date entrance prices for Krka National Park! Depending how long you spend inside the park itself, you may have time to visit the small town of Skradin. Climb up to Turina fortress for a lovely view of the area, or simply wander the streets and find a nice spot for dinner before making your way back to Sibenik. For those travelling on a budget, Hostel Splendido really is one of the best places to stay in Sibenik. The hostel is in an amazing location, just 200 metres from Sibenik’s Old Town. On top of that, there’s a lovely terrace to socialise and meet other travellers. Rooms are air conditioned and start from $38 USD (245 Kuna) per night, although rates can vary considerably during the peak summer months! Click here to check out the latest prices at Hostel Splendido! Medulić Palace Rooms & Apartments are perfectly located in Sibenik’s Old Town. The comfortable rooms are fitted with air con and are brilliantly priced considering the location. Although there isn’t parking on site, there is a car park just a few minutes walk away. Prices start at around $82 USD (530 Kuna) per night during Sibenik’s peak season. Click here to see the latest deals at Medulić Palace Rooms & Apartments for your trip! Located just 3 kilometres from the historic centre of Sibenik, D-Resort Sibenik is the best option if you’re looking for a luxurious stay. The property has fantastic views of the marina and surrounding area, as well as having a pool, gym and spa on site. On top of that, the property has been recognised for the brilliant design by architect Nikola Bašić. Rooms start at around $250 USD (1,610 Kuna) per night, although are considerably less outside of peak season! Click here to check the latest prices at D-Resort Sibenik! Spend the morning of day 7 visiting anything you may have missed in Sibenik, including the fortresses if you didn’t have time on your first day. Once you’re ready, grab an early lunch and set off on a mini road trip to Dubrovnik – the final stop on your Croatia itinerary. 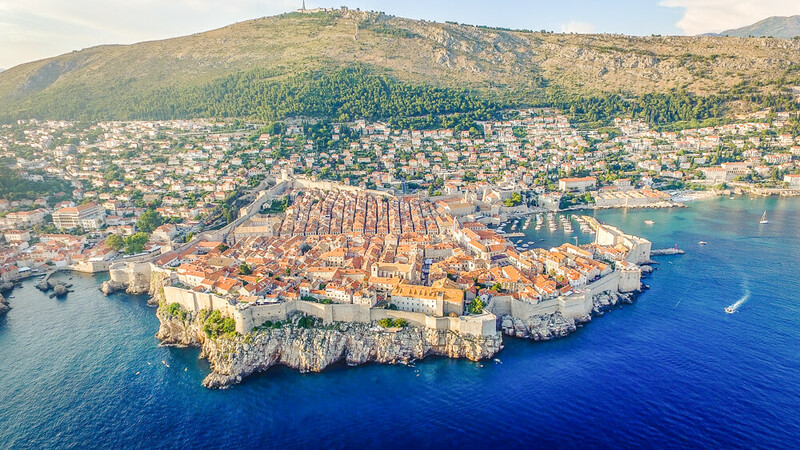 Dubrovnik has become one of the top travel destinations in Croatia, and is a particularly exciting destination for Game of Thrones fans as many of the city’s landmarks have featured in the series. The drive from Sibenik to Dubrovnik briefly takes you into Bosnia and Herzegovina. This means you will have to complete 2 border crossings on your journey – one from Croatia to Bosnia and Herzegovina and then one back into Croatia shortly afterwards. As you are travelling outside of Croatia you will need to make sure your rental car comes with a green card. This should be included in your rental price but you should check before hand. The alternative is to drop the car back off in Split and get to Dubrovnik by coach. By the time you get to Dubrovnik it will be late afternoon/early evening. Check in to your accommodation before heading out for dinner. Once you’ve eaten, take a walk through the Old Town of Dubrovnik, which is a particularly wonderful sight when lit up at night! The incredible Old Town is a large reason that Dubrovnik is seen as one of the best places to visit in Croatia. 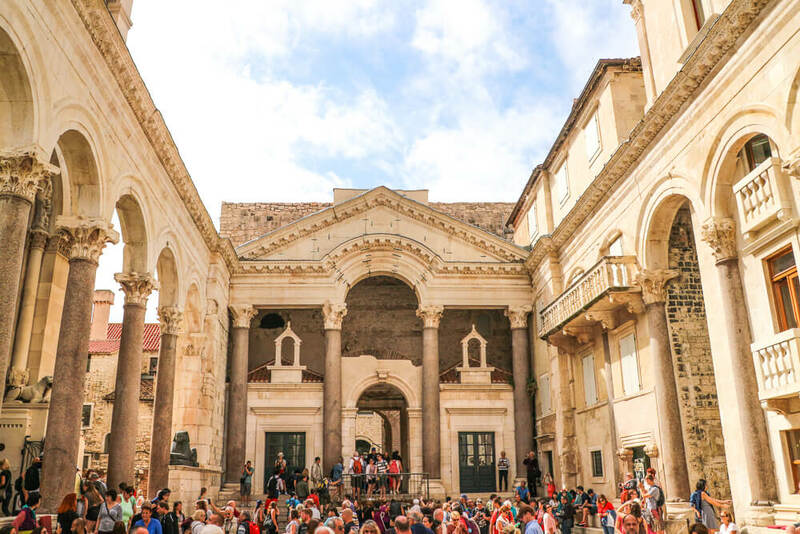 Spend the next day exploring more of Dubrovnik’s Old Town. Prepare for lots of walking as no cars are allowed inside the city walls. Enter the Old Town via Pile Gate before taking a walk along Placa – the main street of the Old Town, which is also known as Stradun. Wander around the historic streets, which will lead you past the Large Onofrio Fountain, Sponza Palace, Rector’s Palace, Roland’s Column and more! If you want to find out more about the sights then a great option is to take a free walking tour of Dubrovnik. After all that walking you’ll have worked up an appetite, so stop for lunch at one of the many restaurants in the Old Town. Once you’ve finished lunch head for the Ancient city walls of Dubrovnik. Walking along the city walls is one of the best things to do in the city, thanks to the stunning views along the way. If it’s a particularly hot day you may want to wait until later in the afternoon to visit the city walls, as there isn’t much shade to cool down in! Visiting the city walls costs 150 Kuna, which may seem expensive but it’s worth the money for one of the main attractions in Dubrovnik. Walking along the walls will lead you to Minceta fortress, Bokar fortress and St. John’s fortress. Included in the price of your ticket is entrance to Fort Lovrijenac – also known as the St. Lawrence fortress. This fortress is built right beside the Adriatic Sea, and offers some great views over the Old Town. By the end of the day you’ll be pretty worn out from spending the day on your feet! Reward yourself with a nice meal and a few drinks before calling it a night. The next day is your last full day in Croatia so enjoy the chance to wander around this historic city some more. Alternatively, head to Sveti Jakov beach, which is just a short distance outside the Old Town. It’s one of the best beaches nearby and offers some nice views of the city. You will have to walk around 15 minutes down to the beach, but it’s worth it for the chance to soak up the sun and relax on your last day! Later on, take the Dubrovnik cable car from just outside the Old Town to get some truly spectacular views. It costs 150 Kuna for a return trip, and once you reach the top you won’t regret parting with the cash. 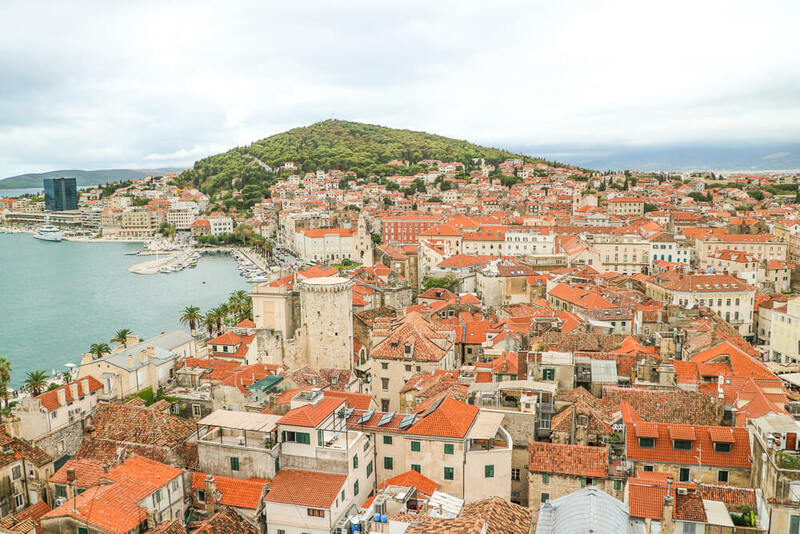 You’ll be treated to amazing views of the city’s orange/red rooftops and the Adriatic Sea. 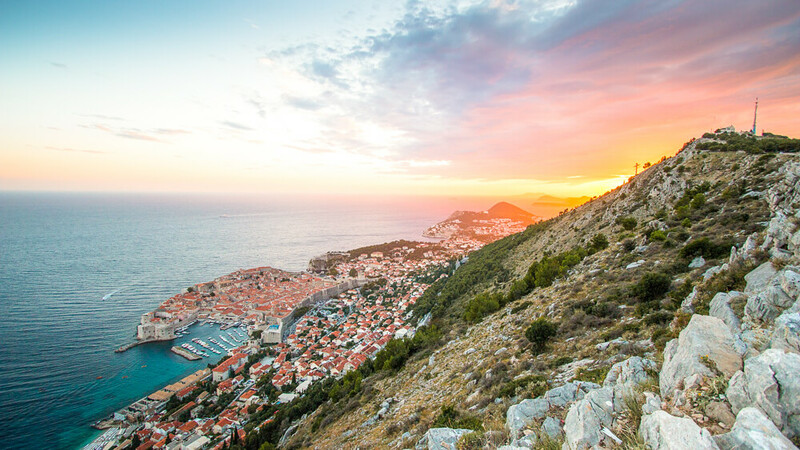 Try to be at the top for sunset for a truly special sight on your last evening in Dubrovnik, before taking the cable car back down. Make the most of your last night in Croatia by enjoying your favourite local dishes once more as well as a few drinks! Afterwards, take one last stroll to admire the Old Town at night. The plan for the last of your ten days in Croatia is very much dependent on when your flight leaves. If you have a later flight then you have time to see more of Dubrovnik. Arrive at the airport in plenty of time to drop off your rental car and wave goodbye to Croatia as you make your way home. Kusalo Guesthouse is a great budget option in Dubrovnik, with the bonus of a swimming pool on site. Approximately a 25 minute walk to the Old Town, the property is well located and is good value considering prices for accommodation in Dubrovnik are much higher than elsewhere in Croatia. Rooms start at around $79 USD (510 Kuna) per night during peak season. Click here to check the latest deals at Kusalo Guesthouse for your trip! Situated within the city walls of Dubrovnik Old Town, it’s hard to find a better located property than Guest House Tomasi. Rooms are comfortable and fitted with air conditioning – so you can escape the heat on warm days! Prices start at $122 USD (785 Kuna) per night during peak season. Click here to see the latest prices at Guest House Tomasi! The brilliant Boutique Hotel More boasts lovely views and a rooftop pool, which help to make it one of the best places to stay in all of Croatia! Located a 10 minute drive away from the Dubrovnik Old Town, the hotel’s waterfront location is beautiful. Rooms at the property are extremely comfortable and fitted with air conditioning too. Prices start at $193 USD (1,245 Kuna) per night during the peak season – which is brilliant value considering how luxurious the property is! Click here to see the latest prices at Boutique Hotel More for your trip to Dubrovnik! 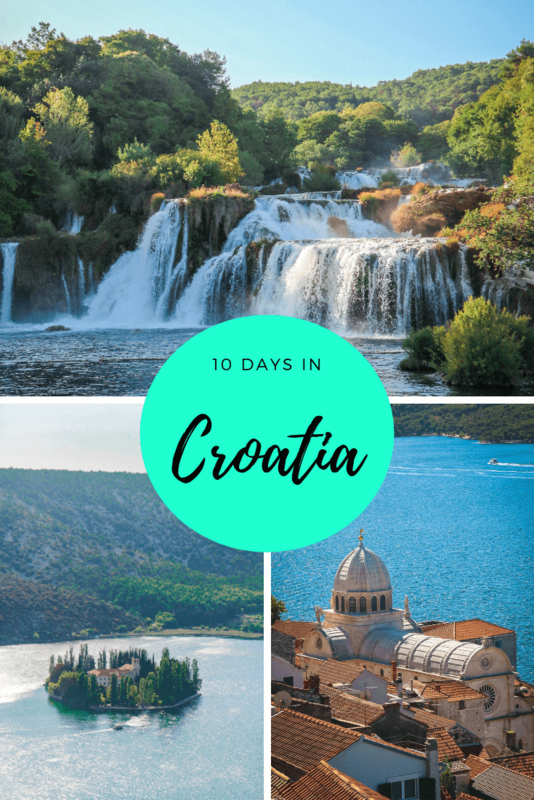 Like this 10 day Croatia itinerary from Split to Dubrovnik? Pin it! The Pics are so stunning.I loved few offbeat places in your guide.Thank you for sharing detailed Guiide. Bookmarking it for future reference. Thank you – we really appreciate it! Hopefully you get to visit soon and see these beautiful places!